The following case studies of change or transformation projects aim to put into context the guiding questions and perspectives described in Section 3: Defining a systems approach. Whilst not all the projects described will have explicitly used a systems approach, the case studies highlight how they have taken into account the people, systems, design and risk perspectives in their work. The spread of examples from the healthcare and engineering sector were deliberately chosen, as were the mix of successes and failures. The range of case studies demonstrate that a systems approach is adaptable to all levels of scale, from service level through organisation to cross-organisation, and sufficiently versatile to apply across all areas of health and care. 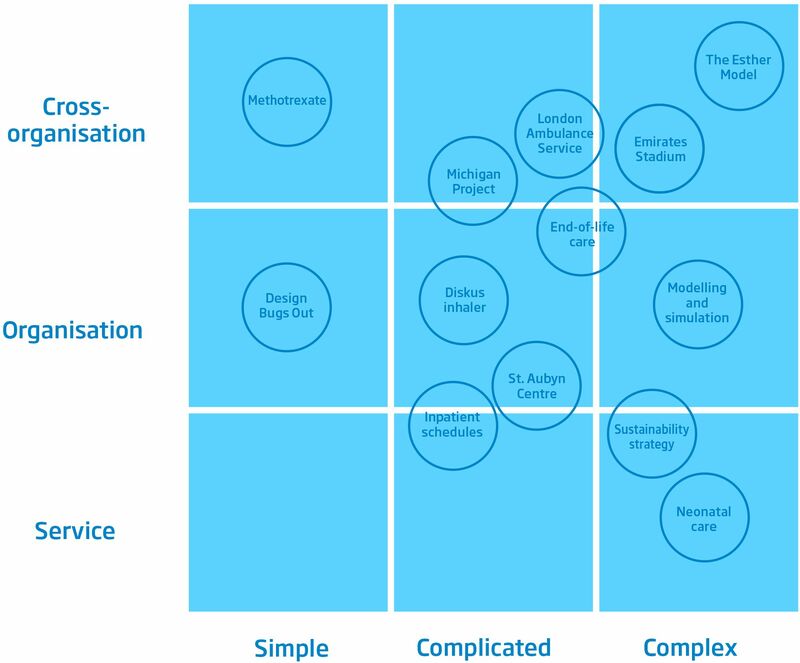 The case studies are representative of systems that are simple, complicated and complex and found at service, organisation and cross-organisation levels (Figure 10). The case studies are representative of systems that are simple, complicated and complex and found at service, organisation and cross- organisation levels.